In this combination of domestic melodrama and high flying flag waving, James Stewart plays a baseball player turned bomber pilot, with June Allyson as his wife. Paramount's biggest money-spinner of 1955, Strategic Air Command is most effective during the thrilling aerial sequences, which were skillfully shot by cinematographers William Daniels and Tom Tutwiler although the crash-landing on Greenland is also impressively staged. 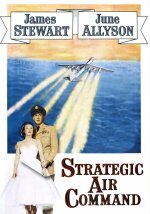 Director Anthony Mann seems more at home with the male-bonding between Stewart and his fellow trainee pilots, but Allyson still makes an impact in a role less saccharin than usual.